So here is my vow – and I hope you will join me – to invest instead in a quality travel mug, cut down on my takeaway/throwaway habit and mobilise my homebrews. I’m sure our collective wallets and the planet will thank us for it. 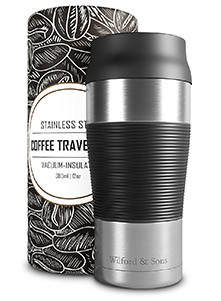 This Lasting Coffee mug has a large 500ml capacity so is ideal for those that want to take larger volumes of coffee on the go – maybe for a long commute or on long walks. In our tests, a hot coffee was still warm after 5 hours, although that may not be representative for all drinks. The stainless steel design looks smart and the whole unit is dishwasher safe on the top rack. Another nice feature is the rubber base which stops the mug sliding if accidentally knocked – not that that should be a concern anyway, as this mug was completely leak proof as we held it upside down. Overall a highly recommended travel mug. 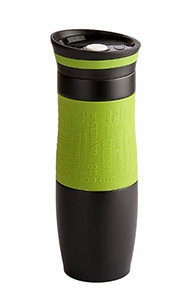 This Contigo Autoseal mug looks the business and what’s more it comes in a range of more than 10 different colour options – so if looks are important to you then you’re sure to find one that fits! The ‘Autoseal’ in the title refers to the drinking system within the lid. You press a button on the back of the mug which unlocks the drinking hole while you sip. Let go of the button and the lock clamps shut ensuring the mug stays completely leak proof. Can be comfortably operated one-handed. Downsides? Well only the lid is dishwasher safe and also this didn’t keep our coffee as hot as some of the others we tried, being only lukewarm after 4 hours. But a beatiful travel mug no doubt. Looks-wise, this is my personal favourite. 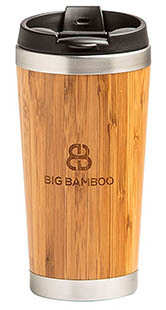 The bamboo design and embossed logo give it a real artisan ‘hipster’ feel. Being made from highly renewable Bamboo on the exterior (although the interior wall is stainless steel), it is also extremely eco-friendly if looking after the environment is top of your mind. However, the bamboo aesthetic may be partly to blame for the biggest negative of this cup – which is that it didn’t keep our drink hot longer than approximately 2 hours. If you have a shorter commute then this may not be bother you but I could see it being a bit of a deal-breaker for some. This travel mug is absolutely beautifully presented, with even the packaging looking extremely boutique chic. The rubber grip around the centre was comfortable to hold and did a good job at minimising any slips. The whole thing goes in the dishwasher which is great for those of us that don’t have the time or inclination to hand-wash anything. Our only gripe here would be that with a relatively small capacity of 360ml may not be enough for some. If so, you may want to look at some of the higher volume mugs shown on this page. The cheapest mug in our round-up and admittedly not quite as fetching as some of the others featured in it’s company on this page. But what it lacks in aesthetics it makes up for in performance. It kept our coffee piping hot for around 4 hours and was still warm at 6. This mug features a large capacity of 480ml, which isn’t the most voluminous on this page but is still adequetely large for the majority of us coffee fiends. The only critiscm is that only the lid is dishwasher safe, and due to it’s design doesn’t always come out sparkling clean and may need a bit of a hand wash to get it perfect. But still a good value option.